It is incredible and a little unnerving to discover that Rio Padice‘s first forays in production came as recently as 2007. 2008 saw him publish his first productions on Mosaik Musik, which were of a more minimal, Techno nature. 2009 saw the successful collaboration with Metroline Limited, which has spawned a a number of releases and remixes, most notably his ‘Road To Alberqueque’ and ‘Twin Peaks’ EP’s. The same year also saw Rio join forces with Massimo Di Lena under their new alias ‘Horacio’ to release two EP’s on the highly acclaimed Raum Musik and Cynosure labels. With Rio currently devoting his time to learning the production techniques of the 90’s, blending the use of software, hardware and sampling, his productions, unlike so much of the current trend for ‘looking back’, have a mature and studied Classic sound and feel to them. 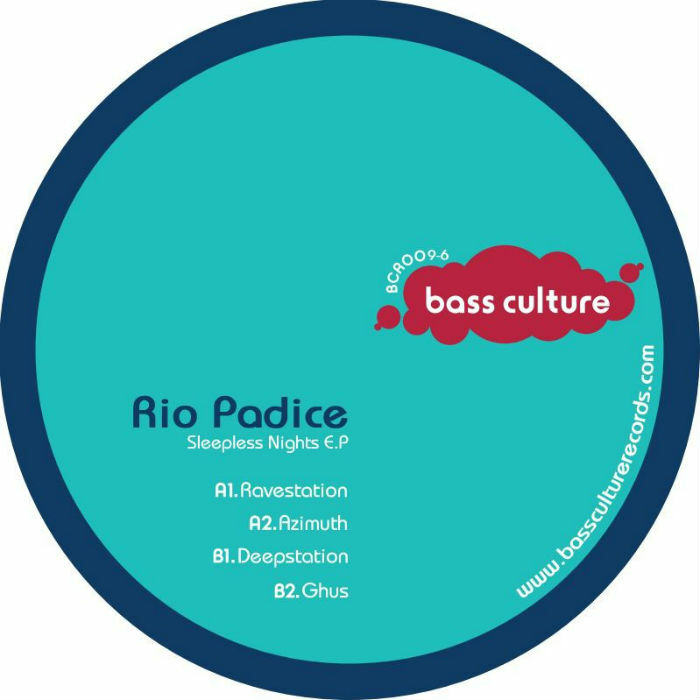 The ‘Sleepless Nights’ EP features a wonderful selection of work, that sees Rio exploring and bringing together the best in Classic sounds with his very own fresh contemporary spin. From the opening house of ‘Ravestation’ with its open hats, dramatic strings and vocal stabs, to the dubby, deep yet kickin’ ‘Azimuth’, via ‘Deepstation’s delicate and warm bass and the final brilliant jackin’ vibes of ‘Ghus’, you are treated to some of Padice’s finest work. Samuel L Session “I like everything by this artist! It has rawness, edge, style and a good groove. Always. To the floor!” – Onur Ozer – “Next great release from Bass Culture!”- Anja Schneider – “Another bomb! Lovin the label so much!!!! !” – Luciano – “Great record … big fan proper house tracky tracks! Full support as all the releases! thx Julz!” – Seth Troxler – “Again, songs that ill play over and over.” – Andre Galluzzi – “Azimuth for sure…thanks!” – Okain – “Amazing ep! I love Rio Padice stuff!” – Matthias Tanzmann – “Ravestation for me here! !” – Tobi Neumann – “Sounds like a classic.. Ravestation is working well for me.. Azimuth also! The 909 will never die!! !” – Lauhaus – “Sick ep again. Will play for sure.” – Nick Curly – “Very good release. Azimuth is absolute great!” – Terry Francis – (Fabric London) – “Like this 1!” – Marc Romboy – “One of the sharpest 909 hihats for years, wooooooooooooooooow!! !” – Danny Howells – “Loving this label, many thanks!” – Guillaume Paco – “Excellent house tracks, with the old school flavor that is really the thing at the moment. Very good and perfect for the summer. I’ll hammer it.” – Paul Woolford – “Solid as always from Bass Culture. ‘Ravestation’ and ‘Ghus’ for me please.” – Brothers’ Vibe – “ALL good!! Full support!” – Sven von Thülen – (Zander VT/De:Bug) – “Another great ep on Bass Culture.” – 2000 and One – “Nice Bass Culture release again!” – Dyed Soundorom – “Always good stuff from Rio Padice! Will play Azimuth!” – Layo – “Great label. Great ep!” – Mathias Kaden – “Ravestation is great!! !” – Tania Vulcano – “Full support all tracks, really good house music.” – Satoshi Tomiie – “Ravestation is my pick.” – Timid Boy – (Rexorama) – “Really nice ep, Azimuth is my fav thanks! !” – Varoslav – “Big trax again! Support hard to choose a fav..” – Anthony Collins – “Azimuth is wicked.” – Martinez – “As usual fantastic grooves from Bass Culture. All tracks have something in themselves and will play them all. But Deepstation & Ghus stands out for me. Great summer bombs!” – Kasper – “Nice Ep as always from Bass Culture! Really like Deepstation. Will play it out!” – Arnaud Le Texier – “Nice ep! Complete one.” – Sety – “Ghus is the one for me. Will play and support!” – Andrew Grant – (DC-10/Barraca) – “Azimuth has a super groove :)” – AFFKT – “Ghus is a good one!” – Federico Molinari – “Very cool release, as usual!” – Raresh – “Cool ep!” – Gorge – “Azimutz is for me.” – Agnes – “Love Rio stuff, FULL SUPPORT.” – Jose de Divina – “Azimuth good sound.” – Oleg Poliakov – “Ravestation for me, love the disco feeling in it.. strong EP!” – Heidi – “Ravestation is nice and jackin…” – Sis – “Azimuth is nice.” – Kabale and Liebe – “Another stomper on Bass Culture! Ravestation & Ghus are my favs.” – Luca Bacchetti – “Classic and stiloso… great ep!! I ‘ll play the tracks for sure.” – DJ W!LD – “Azimuth…support!” – Martin Eyerer – “Can’t decide between Ravestation, Azimuth and Deepstation…all great!” – Shaun Reeves – “Really loving Azimuth. Great release.” – Alexkid – “Nice one from Rio Padice. Azimuth a has a Schatraxey vibe to it!” – Michel de Hey – “Always love the Rio Padice stuff! Cool BC release as well again J” – Mauro Picotto “Really nice! Fav Deepstation.” – Steve Parry – (Juice FM) – “Ravestation’s cool disco strings in the break are great, breaking up a lot of monotonous techiness thats about – nice! Other tracks are cool too.” – Lele – (Floor Radio Italy) – “My fav here is Ravestation, I can see it happening on big floors.” – Stuart Patterson – (Faith Fanzine / Radio) – “Azimuth the pick of a very good ep.” – Chris Ç – (Dinamo.FM / Acik Radio Istanbul) – “Fantastically good and propa’ house music Love to play it all around! !” – Stefan Fontana – (Computer Musik Italy) – “Ravestation is the one! !” – Diversions – (CHRY 105.5FM Toronto, Canada) – “Lovin’ Deepstation!! !” – Roual Galloway – (Faith Fanzine/Radio) – “Rio is a quality producer – another result for Bass Culture.” – Ceoltronic Radio – (RTE Pulse, Dublin) – “Solid as always from Bass Culture. Great stuff. Will feature this on Ceoltronic Radio tonight.” – Karlos Sense – (Ibiza Sonica) – “Excellent Rhythm… Full support to Azimuth.. Congratulations.” – Jose Maria Ramon – (Ibiza Global Radio) – “Deep & sweet tracks here!!! Perfect sound for my shows on Ibiza Global Radio full support.” – Russ – (i-DJ magazine) – “Another winner from Bass Culture! Will support!” – Club Madnezz Holland – “Ghus…nice small club sound.” – Valka – (Paris One Reverse) – “Azimuth has a strong French Touch taste that reminds me happily of the 90s. Sweet, funky and hypnotic!” – Fred – (Paris One Reverse) – “Ravestation tek house tune, love it.” – The Phonic Express – (RTE Pulse, Dublin) – “They just keep on delivering. Ravestation is tops! Im all over it!” – Kiko Martínez – (DocePulgadas RadioShow) – “Great bass…deepstation…lovely.” Ben – (DJ Magazine) – “Loving it. Deepstation in particular. Will review in August DJ Mag for sure. Really great.” – De:Bug Magazine Germany– “Review to follow.” – Radio play by : Nic Fanciulli – Worldwide Sounds – 28/06/10 – Ghus / Floor Radio Italy – 25/06/10 – Ravestation / Phonic Express – RTE Ireland – 24/06/10 – Ravestation / Martin Eyerer – Kling Klong – 19/06/10 – Ravestation / Ceoltronic Radio – RTE Ireland – 17/06/10 – Deepstation. This entry was posted on June 22, 2010 at 13:00 and is filed under Release.